It is the year 1926. The United Kingdom has just created the cartoon Winnie the Pooh and Scottish inventor M. John Baird demonstrates his new machine, the television, which is capable of the moving pictures using a cathode ray tube. Back home in America, boys are losing interest and leaving their family farms. A man by the name of Walter Newman has just proposed the creation of an organization that offered farm boys "a greater opportunity for self-expression and for the development of leadership." Henry Groseclose, known as the Father of FFA, developed the constitution and bylaws for the organization, and in April, the Future Farmers of Virginia was formed. 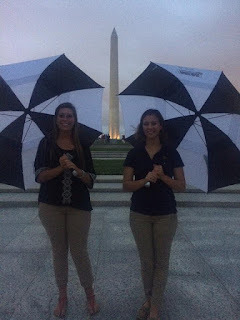 Jessica and I had a blast learning about America's history despite the rain! Flash forward two years to 1928. Newton's idea has reached the national stage at the American Royal Livestock Show in Kansas City, Missouri, where 33 students from 18 states have gathered at Hotel Baltimore. The Future Farmers of Virginia expanded to become the Future Farmers of America. Two years later, delegates voted at National Convention to restrict girls from becoming members of the FFA. However, it is now 1969, and a new set of delegates at National Convention have just voted to allow females to gain full membership in the organization. 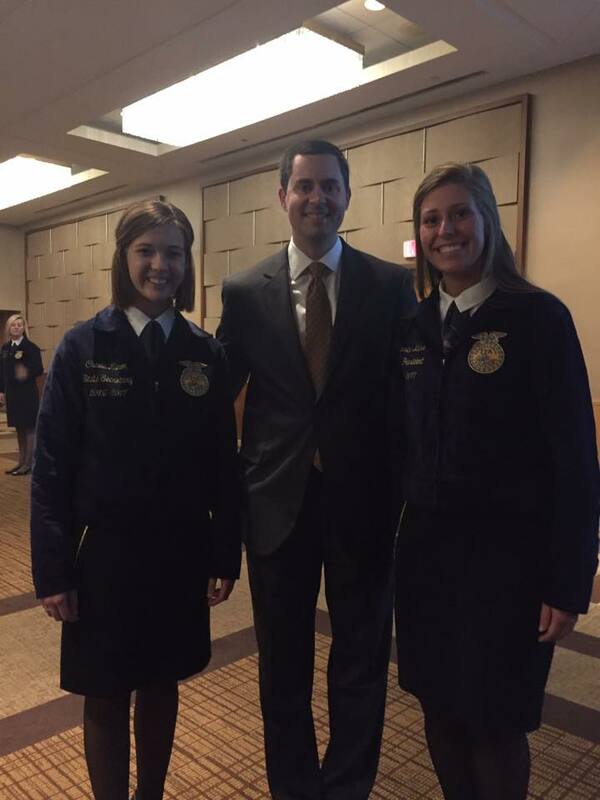 We had the privilege of meeting Mr. Eric Steiner, former Indiana FFA State Officer, who works for Elanco Animal Health at the Washington D.C. Alumni Banquet! Over the first 60 years of the Future Farmers of America, the organization focused on developing farmers to send back home to produce food for not only America, but the world. Picture yourself in the shoes of a National FFA Delegate in the year 1988. You have just become aware of the growing diversity in the organization. 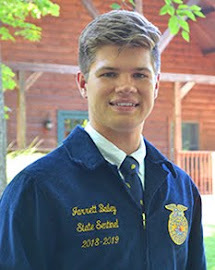 You realize that FFA isn't just about future farmers anymore; it's about future agriculturalists of all types and kinds - biologists, chemists, veterinarians, teachers, engineers, and entrepreneurs. 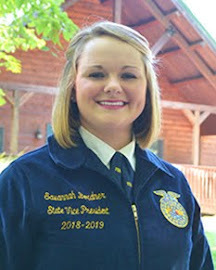 Therefore, you recognize that a change needs to be made, and you vote to change the name of the organization from "Future Farmers of America" to the "National FFA Organization" to reflect the scope of the industry. 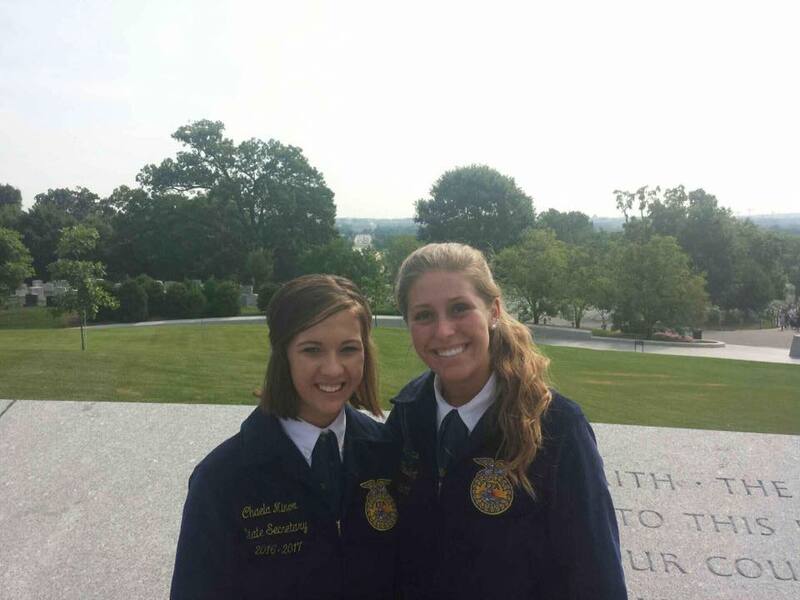 The National FFA Organization has endured many changes throughout its history. This past week, Jessica and I had the privilege of attending State President's Conference in our nation's capitol. Throughout the week, we enjoyed fellowship with other state officers and had the opportunity to have a hand in shaping our organization, as we crafted the delegate committees for National Convention. As we reviewed different proposals made by various state associations, topics such as diversity, servant leadership, and official dress were discussed. At National Convention, 475 delegates from all 52 associations will have the opportunity to make changes for the betterment of our organization focusing on such subjects. SPC attendees learned about true servant leadership as we toured Arlington Cemetery, honoring those who gave their lives for our freedom. Just as our organization has undergone change, we must always endure change as leaders. One of my favorite quotes reads: "It's not about the destination. It's about the journey to get there." Often times, we can reach a goal and think that because we made it to our 'final destination', we can stop striving for progress. However, as a leader, we must always be open to growth so that we can find better ways to serve others. 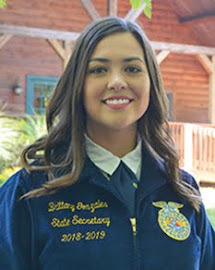 The National FFA Organization has made many strides to improving themselves; in the same manner, we must continually seek opportunities for individual development. Through this vulnerability will come your strengths as both a leader and individual. Every single person is on the journey called life. Where you are right now is NOT your final destination. Fair food scents fill the air, friends and families enjoy the numerous activities, and 4-H’ers showcase the projects that they have worked so hard on. County fairs are the highlight of summertime, embracing all of the events, activities and moments that make summer so fun! Hopefully, you have had an opportunity to visit a county fair. 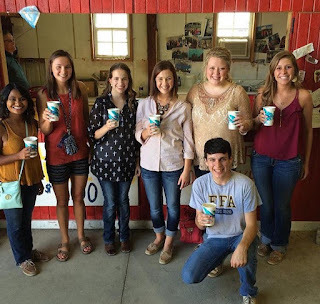 Our State Officer team has had the honor to travel to our teammate’s county fairs to celebrate their achievements and to experience the place that we have heard so much about. We had the opportunity to visit the Clay County 4-H Queen and Princess Pageant and celebrate our 2014 Clay County 4-H Princess, Chaela Minor. Not only were we able to honor Chaela’s reign as princess, but experience her home community and congratulate the newly selected royalty. It was a great opportunity to meet Chaela’s family and friends while supporting Chaela as she showed her heifer and sheep and her many achievements throughout the 4-H program. Thank you South Newton FFA for the AMAZING Lemon Shake-Up's! Newton County welcomed our team with open arms as we traveled to Kentland, Indiana for our teammates Logan and Nathan. We celebrated with Logan and she received her 10-year member awards and showed her hogs. Our team had the opportunity to meet both family and friends of Nathan and Logan. To conclude the day, we were able to enjoy the tractor pull – and were even announced during the pull! Thank you to South Newton FFA for the lemon shake-ups and North Newton for the delicious food. Our team had a wonderful time promoting Indiana FFA at the Johnson County Fair Parade. Although Franklin, Indiana is a quick 15-minute drive from the Indiana FFA Leadership Center, Johnson County is the place that I call home. I had so much fun showing my teammates everything about my favorite county fair and meet my family and friends. I am so thankful for their support while showing my steers, receiving my 10 year awards and celebrating my project achievements with me. We had the honor to have a float in the Fair Parade, serve milkshakes at the Farm Bureau Building, enjoy Indian Creek Ice Cream (Thank You to Indian Creek FFA! ), attend various events and even participate in Farmer’s Olympics. We are looking forward to cheering on Sneha as she competes in Public Speaking in Hamilton County, hearing Leah’s stories from her time in Hancock County 4-H and heading to Boone County for Jessica’s county fair. Three different fairs, four teammates and more to fairs to come within the next week – but this represents something greater than fair, food and fun! 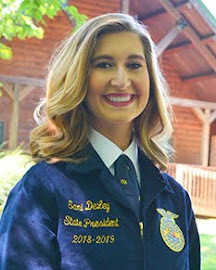 We have experienced where our teammates call home, the places that they have made memories, interacted with FFA members, and celebrated our teammate’s achievements at their county fairs. We enjoyed our time at the Newton County Tractor Pull - and all of the County Fairs we visited! The saying ‘Always Famous in your Home Town’ rings true throughout these experiences. At each stop, we have seen supportive and loving communities who truly care about their ‘hometown hero’ and the entire team. Seeing where our teammates come from, hearing about their stories and diving deeper into exploring the beautiful state of Indiana has held great value through our country fair experience. From meaningful conversations to free food and attractions to new friendships, these communities have amplified the opportunity to embrace us and make us feel like we are a part of their home. In conclusion, thank you to each and every community for being a part of the village that it takes to raise a child. Thank you for including us in your county fair celebrations and sharing each teammate with us this year! We are so thankful for the communities and county fairs we have visited and are looking for to continuing to visit the remaining within the next week. It has been an honor to come and to be included in your activities. So thank you, for not only the days we have spent with you, but the teammate you have given us. As county fairs continue to conclude, the State Officers look forward to seeing you during the Indiana State Fair Work and Experience Days! 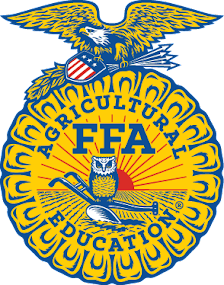 The State Fair is quickly approaching and YOU have the opportunity to come help set up the FFA Pavilion during Set-Up Days and interact with the public during State Fair Experience Days! Please ask your advisor or contact any of your district officers with any questions. The State Officers cannot wait to see you amplify FFA at the Indiana FFA State Fair! The Conference Center at the Indiana FFA Leadership Center was split into four different sections. Each of the four sections had some hungry, hungry FFA members. 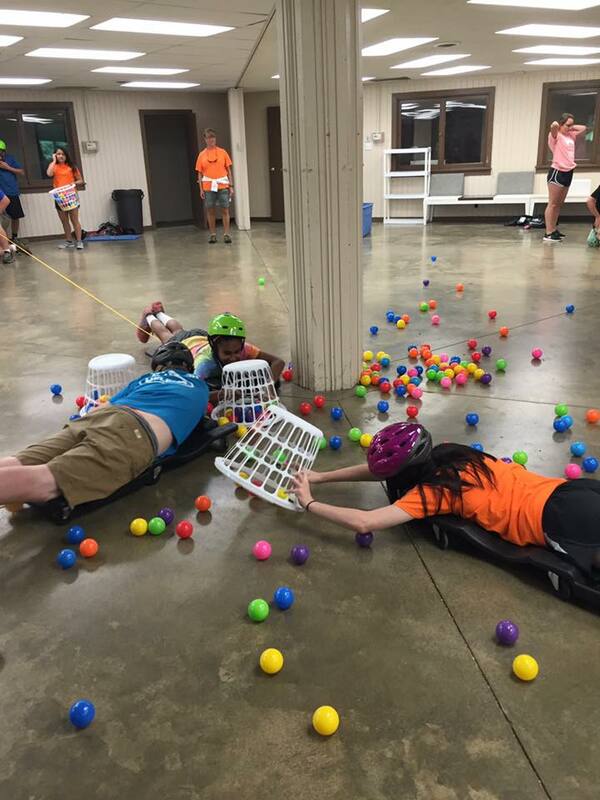 Members had the chance to play a human version of the classic childhood game, Hungry Hungry Hippos. Colored balls were set up in the center of the room for members to “eat” with a laundry basket. As one group member would put on their helmet and lay down on a scooter their teammate would be reeling them in and out with the string attached to the scooter. 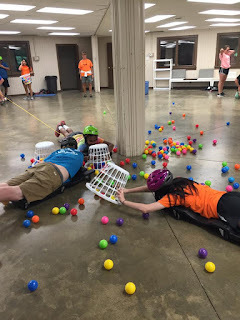 The first goal was to lift up their basket to collect as many balls as possible, but eventually the goal became more challenging. Students were then assigned a color and would only get points for the balls in their basket that were that color. While this was challenging for students, they remained hungry and used that challenge to motivate them. In life, there are times where we want to lose that hunger for success. Times where we become discouraged because we do not reach our goals and dreams, or that loss of hunger may even come from someone else saying we are not capable of achieving our goal. Your goal could be anything from being awarded a Grand Champion Banner to beating your records at the next sports game or winning an FFA Career Development Event. Whatever the goal may be for you, remember to stay hungry for success. Do not let others discourage you and certainly do not discourage yourself. One may not achieve their goals the first, second, or even the hundredth time, but they could easily be on the brink of success and achieve their goal the next time they try. During Summer Challenge, attendees had the chance to look into a different meaning of hunger throughout the Hunger for Innovation Project. Participants discussed that many do not get access to quality nutrition and that 40% of all food in the United States is wasted. Through a poverty dinner, tracking food waste and group discussions members began to realize that the statistics related to hunger are more than just statistics. The statistics represent real people that are hurting not only across the globe, but also right in our backyards. Facilitator Jacob Mueller said, “If you have food in your fridge, clothes on your back, a roof over your head and a place to sleep you are richer than 75% of the world.” While we continue staying hungry, never forget to stay humble. Many of the things we take for granted are what others would do anything to have. Just as Dwayne “The Rock” Johnson once said, “Be humble. Be hungry. And always be the hardest worker in the room.” FFA members, supporters and stakeholders always remember the importance of remaining humble during successes, hungry during failures and hardworking always. There I was, sitting in the back row of the 4th general session of the 87th Indiana FFA State Convention. 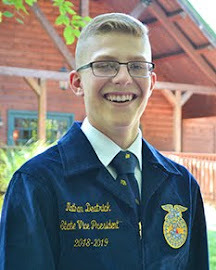 To me it was the longest, most dreaded session of convention, but to over 400 FFA members, it was an exciting, exhilarating, and adrenaline filled experience. 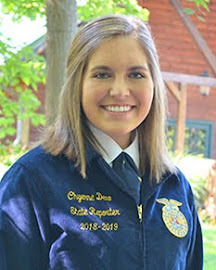 To them it was there chance to be recognized, the Hoosier degree session, where they received one of the highest honors the Indiana FFA Association awards. To me it was the session before I opened that anticipated envelope. The fourth general session was stressful for every state officer candidate. I sat shaking my leg, holding my Hoosier degree chain in my hand, rubbing the charm with my thumb, waiting for that tap of the gavel, so I could head to Stewart 218 and receive my envelope. The walk from Eliot Hall to of Music to the Stewart Center was even worse, with the sun setting, the breeze flowing, and the adrenaline building, my heart began to pump that much harder. I walked up the stairs to the Stewart Center, looked around, saw my friend and anxiously walked towards him. Only four of the State Officer Candidates were waiting at the door when I got there. I spoke briefly with my friend, then began to pace around the hallway. Mr. Martin and Mr. Hays finally showed up and unlocked the doors to the room. We slowly filed in and awaited the arrival of the "envelopes". Before we were handed our envelopes, Mr. Martin made sure to tell us something. This is something that really struck a chord with myself. He made sure to tell us that no matter which names where on the paper, that we were all great kids and that we were all very special. I was handed my envelope and quickly left the room. My plan was to walk down to the basement of the Stewart Center and open my envelope in the freight elevator. 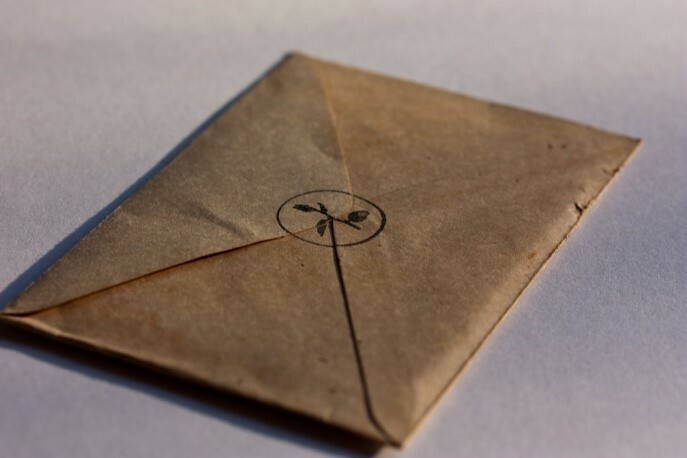 However, I was unable to await the anticipation, so I opened the letter as I was walking down the stairs. As I was reading the paper I noticed four names before I noticed my own. So, the anxiety was built strongly. That moment I read my name I experienced drastic change. Ever since I witnessed my name on that paper, everything has flown by so quickly. I was installed, moved out of my house, moved into the State Officer House, been assigned jobs, met staff, swung off a rope swing into the lake, set up my office space, and done much more. The week since I have be elected as the Indiana FFA State Treasurer has flown by extremely quickly, but has been exciting as well. Us State officers had under 48 hours to pack our belongings and arrive at the Leadership Center. Since arriving, we have gone over the simple procedures of being State Officers, met the center staff, swam in the lake, gone to Trafalgar, and begun Blast Off Training. To say the experience has been mind blowing would be a drastic understatement. 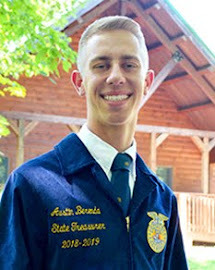 Being elected as a State Officer is filled with a great amount of enthusiasm and excitement, but that eventually turns into stress, busyness, and anxiety. We have jumped right into our roles as officers and taken on a great deal of responsibility. That is however, what us State Officers are here to do, take responsibility, teach responsibility, and showcase responsibility. We are and we will be required to be the leaders of the Indiana FFA Association and that is a lot to take in, in such a short amount of time. Being elected as an Indiana FFA State officer brings a lot of gratitude and enjoyment, but the opportunity has such a greater meaning. We don’t become State Officers just because we want that title. We become, or try to become state officers because we want to be that voice, that figure, or that personality that leads the organization and its members. I know without a doubt that the State Officer team three years ago had a lasting impact on myself. The officer team was a body of individuals that I personally looked up to and the source of much of my inspiration. In fact, that team is responsible for much of my involvement in this great organization. With that being said, the 2016-2017 Indiana FFA State Officer team is looking forward to working with all of the Indiana FFA members to make an impact on their lives and to help them find their own envelope, whether that be chapter office, district office, state office, or even congressional office. The seven state officers are extremely excited to be serving the Indiana FFA association. We are pumped to be ambassadors of agriculture, energetic about the 11,856 Indiana FFA members, and most importantly humbled to have been given the opportunity to advocate for agriculture. Indiana FFA, get ready to go through a transformation in your experiences and become involved in the world of agriculture.